It's been three weeks since I gave birth and apart from being totally and utterly shattered (I'd only like 12 straight hours of sleep....) I'm actually feeling far more confident about my body than I have in years! It's no secret I hated being pregnant. I really wasn't one of those women who flourished with pregnancy, I didn't get a glow, I didn't get super thick hair or gorgeous skin. I got fat, hungry, spotty and I was utterly sick of only being able to buy clothes that had extra elastic in or extra panels. So you can probably only imagine my surprise at total embracing my new mum bod. As a plus sizer, I've never had a flat belly and I've always had body hang ups. I used to be a size 26 and slimmed to a size 18, still not my ideal as I longed for that size 10 label. Now however, I literally don't care. I have a mummy pouch, the ole 'dreaded' jelly belly and I literally couldn't give two hoots. Yes, there are still bits of me that I don't like but I not only grew a bloody human and pushed it out but I've had more people stare at my fanny in the last month than I care to think about and trust me, after that any body hang ups you may of had seem to disappear. I'm back into my small size 18's and I've even been able to get into a few things that I couldn't before I gave birth. 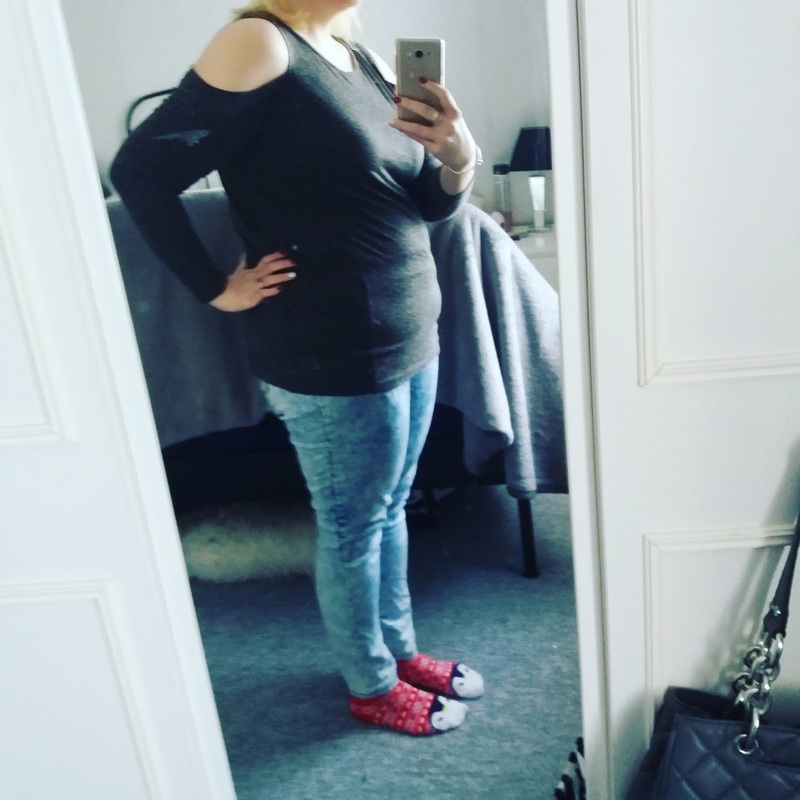 Healthy eating during my pregnancy saw me helped me and even allowed me to be lighter than I was before I got pregnant (although Christmas just happened so I'm around the same now). Don't get me wrong I'd still like to loose a bit of weight but instead of longing for that size 10 label and that additional 4 and a half stone weight loss, my aim is a size 14/16 and a stone, maybe a stone and a half? The aim for that perfect body just isn't there any more. I'm still in awe that I grew and carried a whole human and managed to shove it out despite the fact the pain was so bad I was totally okay with dying! For the first time in my life, I'm not going to let my weight determine my value and I'm sure as hell not going to let my clothes size make me worry about my self worth. At the end of the day like age, it's just a bloody number and if I want an extra biscuit I'm gonna have one! haha loved reading this, you go girl, you pushed a human outside of that body and you rock! The human body truly is amazing isn't it - the fact it can make a tiny human from scratch will always fascinate me. Firstly, congratulations on becoming a mummy!!!! Secondly, GO YOU! So pleased you are feeling so positive about your body - it just did an awesome thing! I felt the same as you, couldn't have cared less about my wobbly bits, and I'm sure no one else did either when I had a scrumptious baby to look at!